VW demonstrated its vision for self-driving shuttles with the Sedric concept, shown. A few years ago, I chatted to a senior Volkswagen Group manager who'd been involved in discussions with Apple about teaming up on autonomous vehicles. In essence, he said, Apple had asked the German autos giant to give it a stack of vehicle and driver behavior data. In return, VW would receive the self-driving system he called "a black box" that it could fit to its vehicles. He laughed. "No, thanks," was the response. Former VW CEO Matthias Mueller admitted as much in a 2016 interview, hinting that the two companies had very different views on the much greater value of the automaker's data. 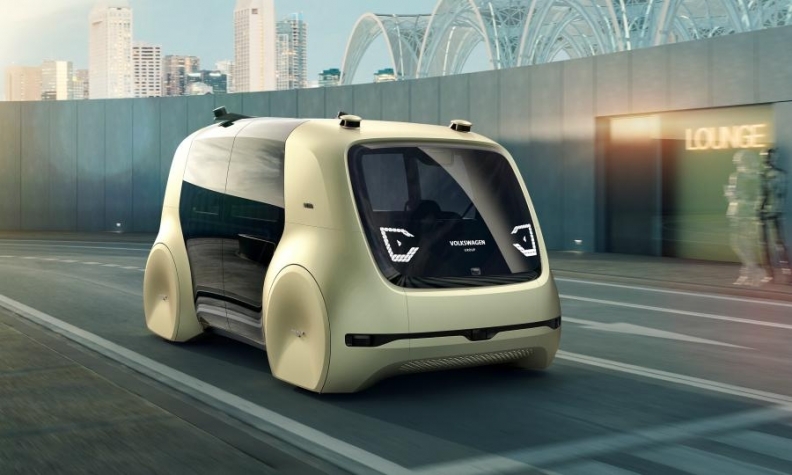 Fast forward to the present day, and the New York Times has reported that Apple is working with a VW subsidiary to transform T6 Transporter vans into electric self-driving shuttles. It's a huge stepdown from the ambitious plans of several years ago. Apple is adapting fewer than two dozen of the vehicles, which will be deployed for a shuttle service between office buildings at its Cupertino headquarters, Bloomberg News subsequently reported. It looks like a supplier-customer relationship, but Apple is the customer, not Volkswagen. While VW has been slow out of the blocks on autonomous cars, it doesn't need Apple, whose self-driving car project stalled and is lagging well behind the efforts of other companies. VW has several dedicated teams, not least a partnership with Aurora Innovation. The Audi division has a team working on the technology too. The new Transporter van arrangement does make sense for Apple, though, after it laid off most of its automotive hardware engineers in 2016 to focus on autonomous driving systems rather than metal-bashing. Hubristic efforts to overturn the autos industry have been replaced by a more realistic step-by-step approach to building expertise. With the VW deal, the iPhone-maker doesn't need to worry about building a car. Instead, it can concentrate on elements where it can add value: The software and user experience. The tricky hardware work is being done by Italdesign, an Italian design studio owned by VW's Lamborghini unit, according to the Times. It emerged last month that Apple is now testing 55 autonomous cars in California: Lexus RX450h sports-utility vehicles leased from a unit of Hertz. That might make it the second-biggest fleet in the state, but other major autonomous car programs have now moved beyond California. They have bigger fleets working in regions where the regulatory regime is more amenable, such as Arizona and Pittsburgh. VW gets to bask in a little Silicon Valley glamour, and maybe further down the line, Apple will order more T6 Transporters. But while the world's most valuable company adapts a few VW vans, Alphabet's Waymo has agreed to buy 20,000 electric SUVs from Jaguar Land Rover Automotive, adding to a fleet of minivans from Fiat Chrysler Automobiles. Apple is driving in the slow lane.